This high definition HD camera is a 1080p HD scientific grade image processing camera that has all in one camera HDMI + USB + SD Card. The camera is attached to a 12" HD monitor. USB capture control for Windows (capture still or moving images). Use included software for making measurements on PC only, will not work with MAC. 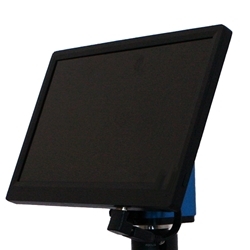 12" LCD HDMI monitor, true 1080P. LED backlight. Monitor mounts directly to HD camera. Includes 110~240V power cord and short HDMI cable.